Cast: Martin Lawrence, Ashton Kutcher, Billy Connolly, Jon Favreau, Gary Sinise, Debra Messing, Jane Krakowski. Directed by Roger Allers and Jill Culton. Story: Deer and grizzly vs the nasty hunter man. 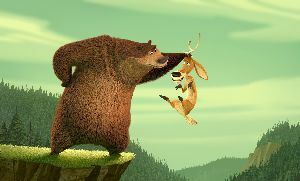 Open Season is Sony's first foray into the lucrative and prolific animated feature market. It's not a bad start, but we've seen it all before. The plot-writers seem to have lost their imagination. As if it wasn't bad enough that The Wild is an inferior copy of Madagascar and The Ant Bully is Antz with knobs on, now we have yet another domesticated-animal-goes-wild movie in the shape of Open Season. This time Martin Lawrence takes the lead role as Boog the performing grizzly, joined by Ashton Kutcher as the deer driven into Boog's care by Gary Sinise's naughty hunter who can't wait three days for Open Season to start. Lawrence must have had a stroke, he sounds just as slurred here as he did in Big Momma's House 2, but nevertheless he does a pretty good job. Ashton Kutcher is far peppier, but he's trying to be Donkey from Shrek and falls far short. Billy Connolly is a welcome addition as the nutty squirrel McSquizzy, but he's a hanger-on in the plot and he's not on screen nearly enough. There's very little for the adults, though it's all amiable enough to keep Mum and Dad amused while little Timmy laughs at the poo gags. Open Season is a nice introduction for Sony into the animations melee, but it's very derivative and comfortably behind the best of breed. Give it a shot if you're a big animations fan. To enjoy this film you should be: revelling in the current glut of animations. Open Season was released in the UK on 12th October.